Driven with perfection, our firm is involved in manufacturing, supplying, distributing, wholesaling and exporting superior quality Mix Papad. We have hygienically processed this range from pure ingredients and spices as per the international food standards. Owing to their natural taste, rich aroma and high nutritional valve, our range is highly preferred in the market. Customers can avail from us superior quality Pappadam Papad which is manufactured from optimum grade ingredients. Our offered Pappadam is a traditional south indian food and is usually take with the meal as a side dish. 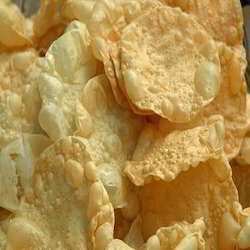 These crispy, crunchy and sumptuous papads are mostly relished during functions, cocktail hours and parties and preferred by the people of all age groups. We provide this range in moisture proof packagings to retain the freshness and taste for long time. Looking for Mix Papad ?